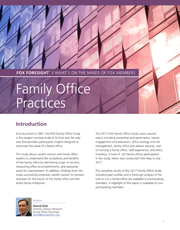 Family Office Practices, a chapter from the 2018 members-only publication FOX Foresight, highlights the key challenges that families are working on, including the scope and cost of services, the value of family learning, the role of governing boards, as well as the role of trustees. This chapter summarizes what we have been learning from the FOX community and our subject matter experts over the last year. To keep you informed of developments at FOX and in the family enterprise market, we would like to email you periodically. To join our mailing list, simply check the box below. You can easily unsubscribe at any time.